Over the years, in addition to engaging with far right activists and politicians in the capacity of commentators and opinion-makers, various Russian media have developed structural relations with the far right media projects in France, Italy and Austria. Recently, new data has emerged suggesting that structural relations seem to be developing between the Slovak magazine Zem a Vek and different Russian actors. Zem a Vek is a typical conspiracy theory magazine with a focus, as Matúš Ritomský argues, on three particular themes: politics, a search for social alternatives, and a return to the nature. The magazine is openly anti-Western and pro-Russian, as well as being particularly obsessed with “exposing” the “power of Jews and Americans”, the LGBT “conspiracy”, and Slovak mainstream media slammed as “mouthpieces of Zionism, Americanism, globalism, defamation of national values, primacy of the minority rights over the majority rights, [and] multiculturalism”. While not being directly linked to Slovakia’s Prime Minister Robert Fico or his SMER party, he definitely benefits from the anti-Western and/or pro-Russian “alternative” new media, including Zem a Vek, that have mushroomed in the Slovak information space in the wake of the Russian-Ukrainian war, as they help him legitimise his non-reformist policies. Selected covers of Zem & Vek: "Homosexualisation or a traditional family? ", "Israel, Holocaust and anti-Semitism: On the Altar of Zionism". In May 2014, two editors of the magazine, Tibor Eliot Rostás and Dušan Budzák, who also directs Rádio Viva, met with Russia’s contemporary Ambassador to Slovakia Pavel Kuznetsov, and published an interview with him in the June 2014 edition of the magazine. In this interview, Kuznetsov, in particular, argued that the foreign policy of the Soviet Union had been based on the promotion of communist and socialist ideas internationally, and that the Soviet Union had paid money to the communist and socialist parties in the Warsaw Pact countries, as well as to the developing countries that had attempted to carry out socialist revolutions. With the demise of the Soviet system, Kuznetsov maintained, this practice was abandoned, but the Americans started employing the same methods which the US accused the Soviet Union of employing: instigating revolutions (“colour revolutions”), financing various NGOs, and promoting its own vision of democracy internationally. In June 2015, an audio file was leaked that contained an unedited version of Kuznetsov’s interview for Zem a Vek. It turned out that the magazine had not published specific parts of the conversation. Two major discussions were left out in the published version: (1) Kuznetsov’s extended discussion of the Russian foreign policy (2) the editors’ attempts to establish closer relations with Russian institutions. I am convinced that in Slovakia there is a good basis, and support among people for this kind of ideas, organisations, movements, which would contribute to the building of stronger relations between Russia and Slovakia. Naturally, we support and will support these movements [and] organisations that favour strengthening of cooperation and relationships with Russia. [...] This might have been our mistake that, in Russian foreign policy, we have abandoned what we used to call “interference” – interference in the internal affairs of other states; [we have abandoned] support – not political, but financial support – of parties in other countries. [...] But I think that, one way or another, we will eventually return to the necessity of, indeed, a more active support – not simply on the political level – of those political forces in certain countries which favour cooperation with Russia. [...] I think that, in the coming years, there will be an increasing support from the Russian side for the political forces in other countries, including Slovakia, which are loyal to Russia. And also support for the media. The editors of Zem a Vek also mentioned that they were thinking of expanding their media business and asked Kuznetsov whether they could receive any support of their endeavours from Russia. In reply, Kuznetsov said that we would be glad “to write to Moscow”, “to people who deal with these questions”, and recommend establishing contacts between Zem a Vek and “the relevant Russian structures”. In September 2014, Kuznetsov was replaced by Aleksey Fedotov as Russia’s Ambassador to Slovakia, and the editors of Zem a Vek established contacts with him too. There is no evidence, however, that these contacts have led to the visibility of Zem a Vek or its authors in the Russian international or domestic media. Even when Rostás announced, in the beginning of 2015, that he and his associates would start collecting signatures for a petition demanding a referendum on Slovakia’s withdrawal from NATO – an effort that the Russian authorities would naturally embrace – the Russian media hardly covered this initiative. Nevertheless, the attempts of Zem a Vek, which changed its subtitle from “Information without censorship” to “Geopolitical and cultural monthly” in February 2015, to establish relations with the Russian structures continued. Russian Ambassador Fedotov introduced, in Bratislava, Rostás and Budzák to Armen Oganesyan, the editor of the journal Mezhdunarodnaya zhizn’ that is officially associated with Russia’s Ministry of Foreign Affairs. Russian foreign minister Sergey Lavrov heads the board of the journal, and Oganesyan is an unsalaried adviser to the foreign minister. 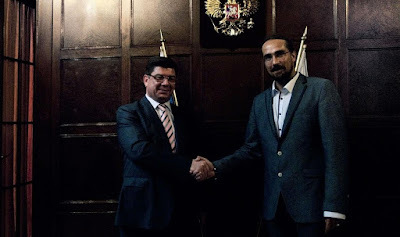 This meeting resulted in Rostás’s and Budzák’s visit to Moscow in June 2015 where, upon the initiative of the Russian Embassy in Slovakia, the editors of Zem a Vek presented their idea of creating a media holding at the round-table held at the editorial office of Mezhdunarodnaya zhizn’. Other participants included “representatives of non-governmental organisations and foundations, as well as representatives of the governmental structures”, while the round-table was held “in partnership with the Union of Oil & Gas Producers of Russia”. I think your project will be carried out. I see one source that will work to the success of your project – the creation of the holding – but I will formulate it as a question: When do you think your product will gain trans-regional and Europe-wide significance? I have no doubt that – if the editorial board [of Mezhdunarodnaya zhizn’] and you are determined – Russian specialists are ready to take the most active part in processing and creating this kind of production, which [...] are much needed especially against the background of the reports that are being produced in Europe on the Brussels’ orders. One needs to compete for the public opinion and the state of minds in Europe. And here we are pragmatic allies with you. Thank you for this. A report on the round-table published by the Russian International Affairs Council, affiliated with Russia’s Ministry of Foreign Affairs and Ministry of Education and Science, noted that the participants also discussed prospects of “constructing” “a Russia-friendly area in Central and Eastern Europe”. So far, the idea of Zem a Vek to build a media holding has not been implemented (yet), but the meetings and talks that Rostás and Budzák held with Russian representatives of different levels testify to the presence of mutual interest in developing structural relations between Zem a Vek and particular Russian groups. If you liked this post, you may wish to consider donating to this blog via PayPal.